I was quite happy to find this book in my NetGalley searches. As the mom of two growing kids grilled cheese is a staple, but having the same-old white-bread-and-American is getting a bit stale for us. Finding new ways to try this sandwich is a welcome addition to my household. The chapters include breakdowns by filling types (cheese only, with meat, with vegetables), recipes influenced by other countries and other sandwich shops that Werlin has visited. Some of the recipes can be a bit exotic for children's tastes; the "Anything Goes" section includes sandwiches with cherries, gaucamole, crab meat and hazelnut butter. 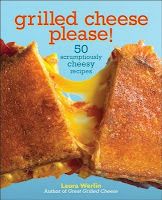 However the chapter on U.S. regional grilled cheeses is sure to please everyone with a familiar style of sandwich. There are also a few side dish and condiment recipes included to enhance the grilled cheese, but not upstage it. 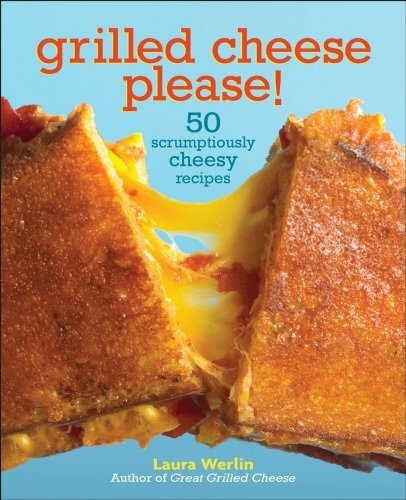 Another good thing about this book is the opening chapter, with tips on how to make the best grilled cheese. Some are obvious, like putting any butter or oil on the bread, not the pan, and a thinner bread crisps better while cooking. Other tips such as grating the cheese or covering the sandwich while cooking to ensure the cheese melts may help that next sandwich you make. Werlin lists several different types of cheeses, including several American artisan types, and explains which ones melt better than others. She also gives some alternate choices for substituting types of breads, for those days you cannot find that pain de mie. Being released in time for National Grilled Cheese Month in April, Werlin has presented a nice range of grilled cheese recipes that will please any palette.